2018 has been a great year for the 2018 Asus in terms of smartphone segments. The company has renewed its entry, mid-range and premium segment smartphones. With 'Zenfone’ Max Pro M1', Asus caught the rhythm again. It was a mid-range smartphone, which became very popular thanks to the powerful battery, stock Android and superb specification. Now the company has come with its successor 'Zenfone’ Max Pro M2'. The company has tried its best to improve the recommendations of Max Pro M1 users. Upgrading to the hardware front was expected and the company has upgraded the whole. Snapdragon 660 processor gives Max Pro M2 660 processor power. It comes in 3/4 / 6GB RAM and 32 / 64GB storage variant. It is the most affordable smartphone to come up with Snapdragon 660 for Rs. 12,999. We got 4 GB RAM variant for review and we suggest that users take this. There is no problem in using this phone day and night. You can play games like PUBG and Asphalt 9 with great ease. We played PUBG in high-graphics settings and there was no problem. The phone got hot after 45-minute gaming, which is normal. The second feature of this phone is a strong battery of 5000 mAh. It usually lasts for up to two days. If you use heavy throughout the day (3 hours GPS navigation, 3-hour video, 1-hour video call, multiple benchmarks and 2 hours voice call), then the battery will fall below 20%. Its weight is also astonishing aspect, which is 175 gm despite the 5000 mAh battery. If compared to Realme 2, then weighing 174 grams with 3500 mAh battery. Its most important reason is Max Pro M2's Total Plastic Body. Asus has given a glossy back, which is what the wave says Finnish design. It has a 6.26-inch screen with a 19: 9 aspect ratios, with a resolution of 2280 x 1080 pixels. The latest Gorilla Glass for screen protection is 6. Asus claims that he has given the speaker, camera, sensors, Notification LED to the front LED flash in the small notch of Max Pro M2. The color of the screen is quite good and sharper. There is also a big upgrade in the case of the camera. Like MI2, there is 12MP + 5MP dual rear camera with Sony's IMX 486 sensor. The overall performance of the camera is good. However, it is difficult to get less light. The front has a 13MP camera, which captures the photo with good detail. With LED flash, there is good selfie in low light. The company has come up with stock Android to Zen UI, which boosts performance and battery life. This is the value for money phone. It's counter-Reality 2 Pro. 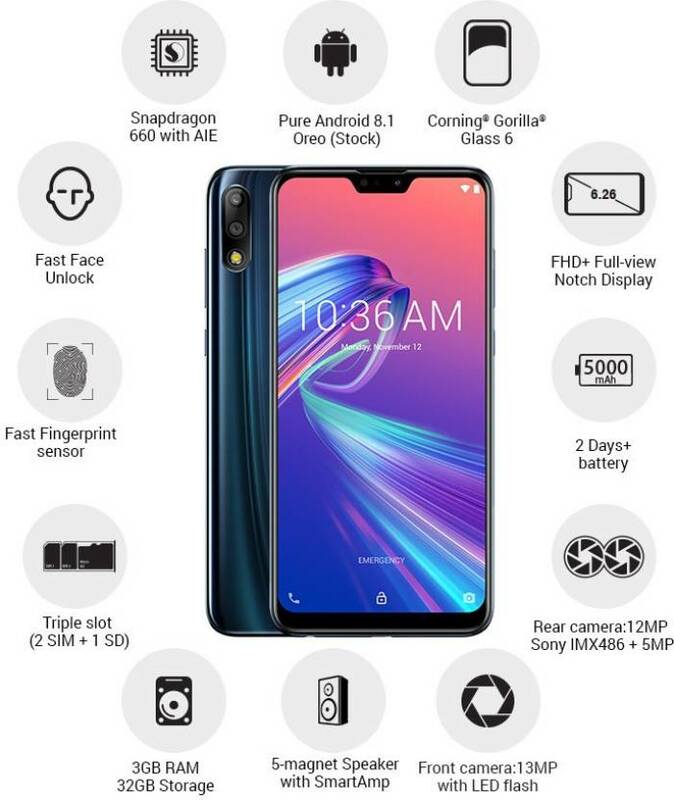 Reality 2 Pro gives Snapdragon 660, 4GB RAM, 64GB of storage, better face unlock and a slightly better camera for Rs 13,990. However, its battery is small and Gorilla Glass 3 has been given for protection. At the same time, its color OS is also much more than stock Android.